Not a tremendous amount of information is available about the submachine guns that were designed and built in the 1980s as attempts to improve the MP5. 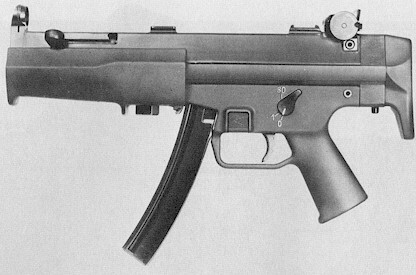 The SMG I, the SMG II, MP2000 and MP5-PIP are designs that became functioning firearms, but never reached full production status. All but the MP5-PIP and the MP2000 included a valve that was just forward of the magazine for the selection of super or subsonic ammunition. All of these prototypes with the exception of the MP5-PIP were designed with integral suppressors. The SMG I and II are covered here. The SMG I was designed in 1981 for the United States Navy under the JSSAP (Joint Services Small Arms Program) Advanced 9mm Submachine Gun program. 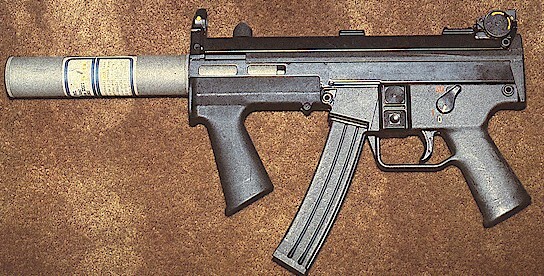 The SMG II was designed in 1984. The primary difference between the SMG I and II is the rear sight. The SMG I had the rear sight similar to the HK21 series. 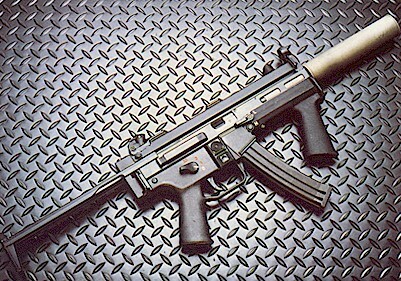 The SMG II was similar to the MP5 series. The SMG I without suppressor attached. It used a conventional MP5 magazine. Other notable modifications borrowed from other weapons included the scope mount from the G41/HK21/MSG90 series and the overly complicated HK21 series rear sight. In front of the magazine is a valve to handle either supersonic or subsonic ammunition. SMGII without integral suppressor. 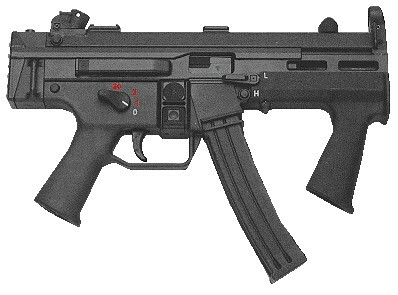 Most noticeable is the standard MP5 sighting system, a departure from the SMG I which featured a sight reminiscent of the HK21 series. This gun features a burst group marked 0-1-3-30. The "L-H" switch above the front of the magazine is for low or high pressure ammunition, or sub/supersonic ammunition. the integral retractable stock is fully closed. This gun also features a forward assist, shown directly above the selector lever. This can also be called or referred to as a silent bolt closure device. Also quite obvious is the proprietary magazine. The SMGI used MP5 magazines.